This was a high velocity experimental utilizing multiple light weight projectiles that were swaged to a much smaller diameter when leaving the muzzle. RICA stands for Robinson Improved Conventional Ammunition and was designed by Russ Robinson. These rounds date from the late 1960’s to early 1970’s. SSB stands for Salvo Squeeze Bore. 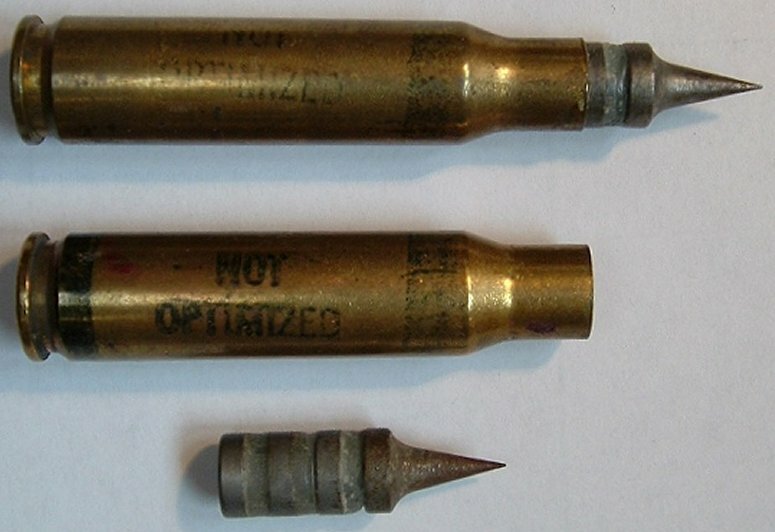 The sectioned round shows a stack of 3 projectiles. The headstamp is commercial – SUPER SPEED 308 WIN and is loaded with an IMR type powder. In this example, a stack of three projectiles is used. In this picture, note the stack of four projectiles compared to three inthe sectioned example above.. Note the ‘ EXPERIMENTAL NOT OPTIMIZED’ ink stamping on the case wall and the bands at the base and shoulder. Typically, these markings are not found on most rounds and may indicate that they have been cleaned or that these are earlier rounds and were so marked.